This TBS Ten features everyone’s favourite foodie, Maggie Beer, where we find out why she can’t keep crunchy peanut butter in the house and why she’s a fan of Waleed Aly. TBS: What do you think the key factor is in you ending up where you are today career-wise? Maggie Beer: Probably a few things. One is tenacity, loving the journey, having a positive frame of mind and loving to find solutions. I don’t see problems, I see issues that require solutions. TBS: Who do you consider the most intriguing public figure to watch at the moment? Maggie Beer: I actually think Waleed Aly is one of the great public figures to watch, because of his background and what he can do. He is such an intelligent man who shows what great immigration is all about and has a very strong voice. He has a voice of reason and intelligence. TBS: What is the worst way for a person to try and get your attention on social media? Maggie Beer: Well I have to be honest – I keep my distance. My team does the social media as I don’t have Facebook. If someone has a problem with me, I would prefer them to air criticism directly to me; everyone can do things differently and better. I am happy to accept any critiquing or criticism and I always like to look at it and think is it fair or unfair, but I would prefer people to write to me directly and I will always respond, rather than posting a perceived negative, perceived being the key word, and publicly posting it online. TBS: If you could determine the exact influence you have on a young person, what do you hope she or he would gain from observing you? Maggie Beer: Well I think determination and always learning, a positive approach and surrounding yourself with positive people. If I can give confidence to a youngster by being in that orbit I am very happy. TBS: What advice would you give a 15 year old Maggie Beer? Maggie Beer: To simply never stop searching. It would definitely be never stop searching. Maggie Beer: (laughs) Well, I love crunchy peanut butter! I love it from the health store, and I can’t keep it in the house. I can’t control myself. TBS: What is your favourite pretentious word to say in unrelated situations? Maggie Beer: Oh it’s definitely the word epiphany – I absolutely love that word! Maggie Beer: I have to admit, well…it’s books, it’s usually books that I would re-gift. TBS: What is your favourite inspirational quote or person, as cliche as it may be? Maggie Beer: I don’t know if this is a quote from anyone, but it’s one i would like to use: “Choose happiness.” I love that, to always choose happiness. TBS: We love what the Maggie Beer Foundation is doing with aged care, can you tell us about what you are doing in that space? Maggie Beer: Well it’s a huge journey because it’s a complex world – people working very hard with not enough budget or resources or the most current information. So what we are trying to do is encourage and inspire and show cooks and chefs in aged care facilities, give them ideas and kudos so that they have the opportunity to do something very special for the people in their care and teach them about food. Everyone deserves a beautiful meal every day and it has to be full of nutrition that an ageing body needs, but it must also give pleasure. Pleasure is a really important part of life. Maggie Beer AM is a culinary icon, food author and restauranteur. 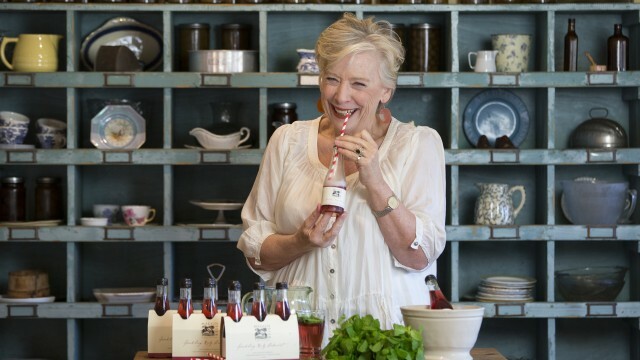 Maggie’s true passion is doing exactly what she is doing now; inspired by the Barossa Valley’s abundance of fresh produce, Maggie Beer Products bases its reputation on using quality ingredients, in season, to produce the best niche gourmet products available. So whether your first taste of Maggie’s range is from the seasonal kitchen at the Farm Shop, or one of her fruit pastes or pates, you’ll be enjoying the very essence of why Maggie does what she does, the inspiration she draws from the Barossa, and the reason so many recognise Maggie herself as a Barossa food tradition. The one criticism I have about Maggie Beer is that she keeps hiding her wings. Come on Maggie, out yourself! Maggie is the most inspiring woman thank you for posting this! My favourite Maggie Beer recipe is the rabbit prune and pancetta pie! droooool. I love peanut butter too Maggie lol!